« PWP in Council Bluffs, IA on March 21st! With Shorty Biggs stepping in as ring announcer for Paul Parker and 75 fans in attendance, LWA put on, arguably, their best show in Granite City, IL at the River’s Edge Complex. Every match kept the fans anxious and ready for the next, with everyone going crazy during the Fans Bring the Weapons Match. Before the opening bout pitting Dorian Victor, J.C. Bravo, “Irresistably Flawless” Brandon Aarons and “Future” Donovan Ruddick against each other in a fatal four way, Luke Roberts announced that if any competitor pinned Victor they would get a title shot against Heavyweight Champion Jeremy Wyatt. Bodies were flying everywhere from the moment the bell rang. Early on, Aarons jumped off of the top turnbuckle onto Victor who was walking by on the outside. Brandon Aarons tries to take out Dorian Victor early on in his hopes of earning a title shot against Jeremy Wyatt. Each competitor had his time to shine in the match up, but Ruddick clearly dominated. At one point, Ruddick easily set Aarons then Bravo on the top turnbuckle, then picked up both men and slammed them to the mat. Ruddick’s supremacy easily put him over the top, and he decisively pinned Victor. Only moments after the ending bell rang, Darin Childs attacked Ruddick with a steel chair. Darin Childs attacked "Future" Donovan Ruddick only moments after his victory. Roberts returned to ringside and handed Ruddick the official papers for his upcoming title match and said MsChif will make her LWA return against Rachel Summerlynn, which segued into Summerlynn’s match against LWA debuting Alektra Blue. Alektra Blue and Rachel Summerlynn both made their LWA debuts at the first night of the double shot. The fans seemed solely behind Blue, but both women possessed the athletic skill that could have secured them victory. After some heckling from the audience (the superfans specifically), Summerlynn and Blue put one of the better women’s matches seen in this area. Summerlynn defeated Blue with a piledriver despite Blue’s determination. Summerlynn soundly defeated Blue with a piledriver. “Thee” Brandon Espinosa took on his Texas Mexican counterpart in Chingo, one of a number of IWA-Texas stars featured at the double shot. Espinosa was slow to start the match-up, perhaps because Aarons did not accompany him to ringside. However, once the two locked up, they had a fairly competitive match-up. Chingo seemed to have the advantage over Espinosa, but the referee being in the wrong place at the wrong time cost Chingo the win. 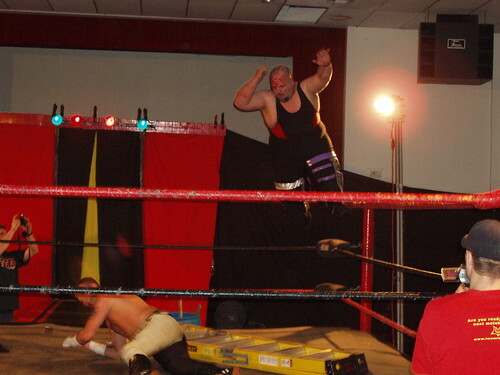 Espinosa took more of a technical approach in his offense, although, the missed frog-splash became his downfall. Chingo gained momentum off of Espinosa’s error, but the referee’s placement when Chingo went for the win ruined any chance of the Texan earning a victory. With the referee knocked down, Espinosa hit Chingo with a low blow followed with a flying roundhouse kick from the second rope to cheat his way to victory. In the number one contenders match for the LWA Tag Team Titles, LWA’s Pierre Abernathy and Evan Gelistico with Tiffani LaFane took on the North Star Express (Darin Corbin and Ryan Cruz), accompanied by pNut, in arguably the most entertaining bout of the night. From bell to bell, it was impossible to look away without missing a stellar move or an impressive double team. Ryan Cruz took to the air in their classic match against Evan Gelistico and Pierre Abernathy. The Submission Squad and NSE had styles that clashed perfectly to deliver a great fight, complete with a cat fight between LaFane and pNut, who both interfered at one point or another. Despite a valiant effort on Gelistico and Abernathy’s behalf, Corbin and Cruz walked away with the title shot in O’ Fallon, IL the following night. After the scuffle between pNut and Tiffani LaFane both teams tried to quickly gain the advantage. The second Texas star of the night, J.T. Lamotta had his hands full against “Spitfire” Davey Vega, who had LaFane by his side. Wrestling for Lamotta’s ACW Heavyweight Title, Vega pulled all of his tricks out of the bag, so to speak, in his attempt to walk away with the belt. JT Lamotta uses his fast paced style to gain the upper hand against Vega. Move for move, these two men showed that they both have what it takes to be a champion. Vega showed the fighting spirit that the LWA faithful have seen before in matches such as the eight-man elimination at Circus Maximus and the Tables, Ladders and Chair at Yuletide Terror. However, Lamotta refused to leave Illinois without his property, and he inched out a win with the cradlebuster to retain. Gelistico came to aid LaFane in carrying his fallen comrade to the back. During intermission, Corbin and Cruz sold NSE merchandise and took pictures with fans, along with the IWA-Texas stars. As the action got back underway, a confused Gary the Barnowl wrestled Arik Cannon, but LaFane refused to let Gary be himself and did not let him “fly” around the ring. LaFane attempted to interfere on a number of occasions, and was almost hit, inadvertently, by Gary. Tiffani LaFane tries to help Gary the Barnowl score a tainted victory over the IWA-Texas star Arik Cannon. In this intense bout, Cannon and Gary both seemed to have the match won, but their willpower matched evenly, and neither wanted to give in. LaFane’s influence on Gary may not be the best thing for him, because Cannon took the win. Gary flies onto Cannon in an attempt to derail Cannon from the win. The match everyone had been waiting for would finally happen next—Fans bring the weapons. Complete with a Bible, a bag of thumb tacks and the Bucket of Doom, which consisted of hockey sticks and antlers, Jordan Lacey and Wyatt had anything and everything at their disposal for the brawl that would develop. In the Fans Bring the Weapons match, Lacey and Wyatt held nothing back, as Lacey launched from the top rope with an elbow drop. Wyatt reads the Bible brought by a fan only moments before he slammed it onto Lacey's skull. They only stayed in the ring for a short while, until rapidly moving from ringside straight through the audience. 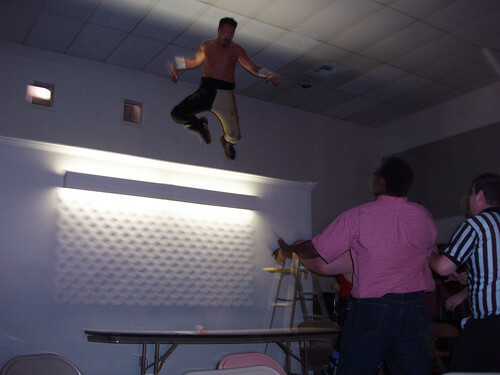 As fans scattered from one side of the building to the other, Wyatt got Lacey injured enough so that the champ could climb to the top of the entry way and launch onto a wounded Lacey. Wyatt climbed to the top of the entryway and flew with caution to the wind onto Lacey. The insanely impressive jump elicited an “L-W-A! !” chant that solidified Wyatt’s value to the company, whether or not one agrees with his tactics. At the end, when it appeared that Lacey might come away victorious, Victor ran out to cause just enough of a distraction for Wyatt to pocket yet another spoiled victory. To find out how the second night of the double shot developed, keep checking lwawrestling.com and Missouri Wrestling Revival for Brian Kelley’s upcoming review. This entry was posted on March 20, 2009 at 7:19 am	and is filed under Uncategorized. You can follow any responses to this entry through the RSS 2.0 feed. You can leave a response, or trackback from your own site.